Is the Federal Reserve’s Great Unwind already coming unwound? I thought it would be good to check up on Federal Reserve balance sheet reduction since the Fed is supposed to be up and running on the move out of quantitative easing this month. It should be fascinating to see what progress the Fed is making as it happily applauds its own successful recovery. After all, the Federal Reserve’s End of Quantitative Easing Didn’t Happen last time they said it would. It turned out the Fed actually planned to continue QE at a gradual level by reinvesting matured assets. Nevertheless, the mere announcement in 2013 that it would terminate QE in 2014 created the infamous “Taper Tantrum.” The Fed hadn’t said anything back then that I was able to find about reinvesting the funds in its balance sheet until after they supposedly stopped QE in the fall of 2014. It turned out the stop was not a quite a full stop. Unwinding its balance sheet is likely to prove to be the Fed’s Gordian knot. The Federal Reserve claimed it was going to start balance-sheet reduction in October at a rate of $10 billion per month and then start increasing that reduction in January by $10 billion per month until eventually it is unwinding at a rate of $50 billion a month, which will be the rate at which it plans to continue unwinding. Oops. Instead of reducing its balance sheet (unwinding quantitative easing) by $10 billion this month, The Federal Reserve actually increased it by $10 billion! Yikes! Did they find they needed to start QE back up as soon as they unwound $o.001 trillion? After reading the above summary, I dug a little deeper to find the Fed’s latest October 26th release. It shows the balance back down to $4.460 trillion. Still oops. 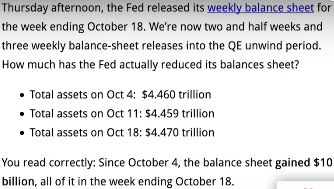 That’s right back to exactly where they started the month, and that is the final balance sheet release for October! Now, it could just be that the Feds are moving accounts around and plan a $10 billion reduction on the last day of the month now that they know pretty well where the month stands. That would actually be the smart way to go about it. If that’s the case, that won’t show up until their next balance sheet release on November 2nd. The final proof of the Fed’s ability to start unwinding will be in next week’s release when the last few days of October are all in. But if you wonder why the economy and the markets haven’t experienced any jog from the unwind so far, it’s because there hasn’t been any unwind so far; and the reduction that is planned (if it even happens) is a minuscule dose — a mere trial run — in order to test the waters. Clearly, the Fed is moving with extreme caution … if at all. That tells you with certainty that even the Fed knows its balance sheet reduction is perilous. After all, the entire national economy has been “rebuilt” upon that balance sheet inflation. Stay tuned. If the Federal Reserve’s balance sheet is not down by next Thursday’s balance sheet release, something has gone wrong with the plan. The time to watch is now.